PCHand iTransfer is an excellent Transfer and backup tool combining iPad Transfer, iPod Transfer and iPhone iTransfer. This iTransfer can fast transfer and copy movies, music, videos, TV shows and podcast from iPad/ iPod/ iPhone to computer. We can also backup iPad/ iPod/ iPhone contents to iTunes with PCHand iTransfer tool. 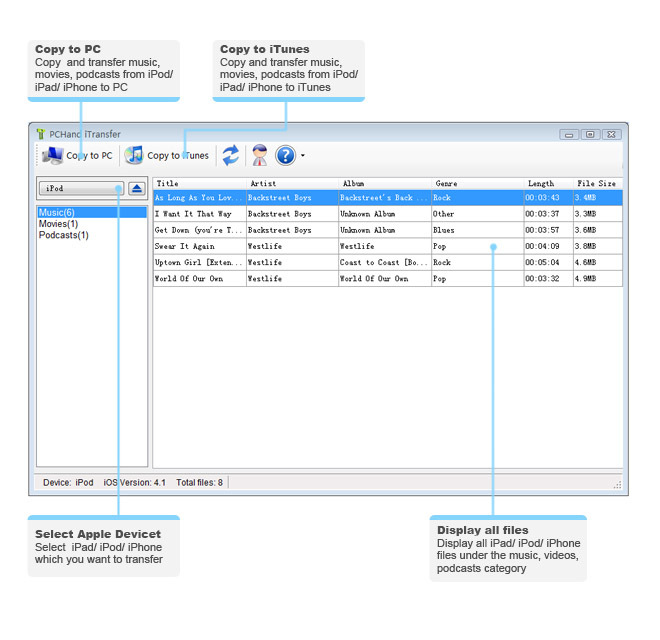 It is totally compatible with iPad, iPhone, the latest iOS 4, iPhone 4, all series iPod and iTunes 10. ...... music, tv shows,podcasts to iTunes fast and smoothly. PCHand iTransfer is an wonderful iPad / iPod / iPhone to computer transfer which provides you an easy way to copy and transfer songs and videos from iPad / iPod / iPhone to computer. You could share iPad / iPod / iPhone music, TV shows, movies and all iPad / iPod / iPhone files with friends freely by transferring your apple device files to computer or iTunes with fast speed. PCHand iTransfer fully supports all series iPod including Pod, iPod nano, iPod Nano 5G, iPod Nano Chromatci, iPod Shuffle, iPod Shuffle 4GB, iPod Video, iPod classicn iPod touch, iPod Touch 3 and the latest iPod Touch 4, iPad, iPhone, iPhone 3G and the latest iPhone 4. Meanwhile, PCHand iTransfer totally supports Windows 7, Windows 64Bit OS and iTunes 10.1. Qweas is providing links to PCHand iTransfer 1.0.0 as a courtesy, and makes no representations regarding PCHand iTransfer or any other applications or any information related thereto. Any questions, complaints or claims regarding this application PCHand iTransfer 1.0.0 must be directed to the appropriate software vendor. You may click the publisher link of PCHand iTransfer on the top of this page to get more details about the vendor.